About a year ago my son became fascinated with how frequently my husband and I took pictures, primarily of him. We caught him a few times trying to get out one of our digital cameras. In a flash of genius I decided to occupy him with an unused disposable camera I had on hand. He loved it! He started going around the house taking pictures of the dog, his toys, us, you name it. We thought it would be funny to get the pictures developed to see things from his perspective. A year later he still has a disposable camera that he whips out every so often. He has caught onto the fact that I also frequently photograph food and has become fascinated by it. I actually caught him one time lying on the kitchen floor on his belly trying to take a picture of the dog’s bowl of kibble. I had a good laugh over that one. So this week I received my usual produce delivery and got it arranged on the kitchen table to snap a photo of it for my blog’s Facebook page. 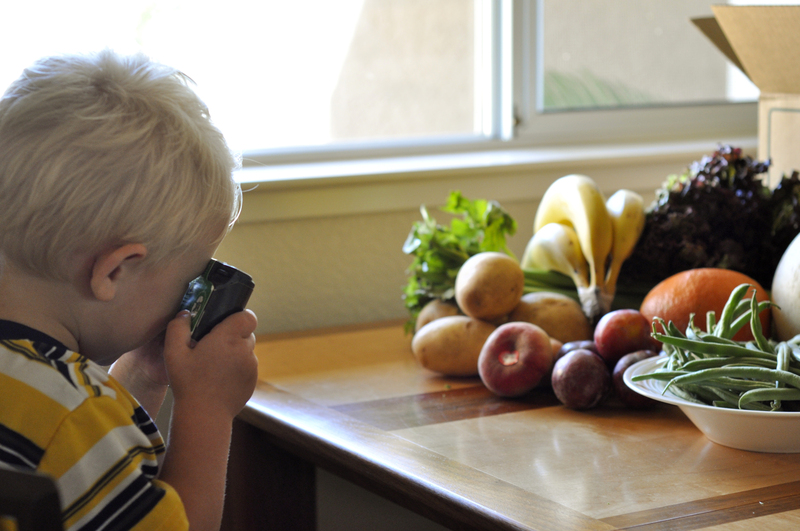 He saw me doing this and he quickly went running out of the kitchen to get his camera yelling, “I take picture too!” This is a quick shot I got of my 2 year old photographing our produce on the kitchen table. I just thought it was cute and had to share. It certainly put a smile on my face. That’s my boy!